The teaser of Rajinikanth's 2.0 is all over the Internet with over 32 million views in 24 hours. The crazy viral video of Rajinikanth's film has over 24 million views from YouTube (consolidated views from Hindi, Tamil and Telugu videos) while social media platforms such as Facebook and Instagram added the remaining seven million views. 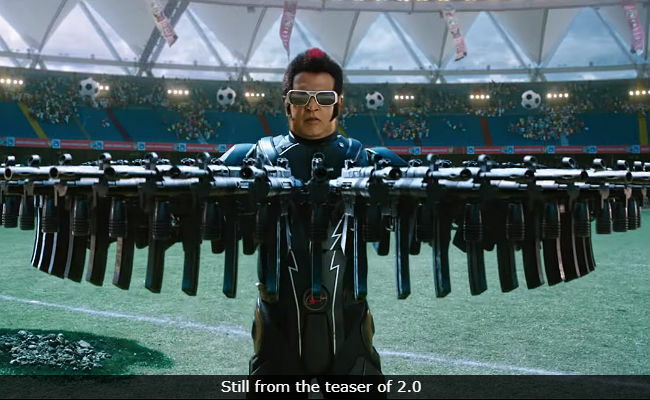 The teaser of 2.0 simultaneously released in theatres in 3D and 2D formats "Thanks to the lovely fans who showed amazing response for our 2.0 teaser in the theatres," Lyca productions (the film's producer) tweeted along with the details of the teaser's digital views. The teaser of 2.0 released on Ganesh Chaturthi. Have you seen the teaser yet? 2.0 is the sequel to Rajinijkanth and director S Shankar's 2010 film Enthiran (released as Robot in Hindi). In 2.0, old nemesis Dr Vaseegaran and his creation robot Chitti (both played by Rajinikanth) join forces to fight a new enemy played by Akshay Kumar. The one-and-a-half minute trailer has several stunning action sequences the impact of which is heightened by the stupendous special effects. 2.0 is also Rajinikanth's second release of 2018 after Kaala, which released in June. Kaala did not tank at the box office but it did not rattle it either. The expectations from 2.0 are high because of the previous film's phenomenal success and the curiosity about the story. The release date of 2.0 has been rescheduled several times and it has finally been fixed for November 29. 2.0 also stars Amy Jackson, Sudhanshu Pandey and Adil Hussain. The film's music is composed by National Award-winning AR Rahman.